Attractive is the word to describe this original piece of art with copper framing a rainbow hued opalescent glass. UL listed for wet locations. Select from an array of matching lights. Bulb: 100W Max. 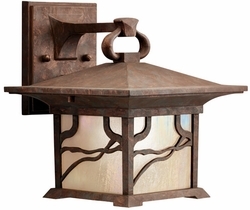 - Lamp width: 8.5" - Lamp height: 9.5" - Extension: 9" - Height from center of wall opening: 2.75"